Charts only, and one size only. To go up or down in size change needle size and/or yarn. Gauge 15 sts and 30 rows is 4 inches in Cat’s Paw pattern. Pattern takes 3x 50 g of yarn if you use Rowan Fine Lace. 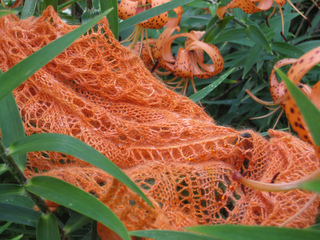 Skill level: adventurous intermediate to advanced knitter. 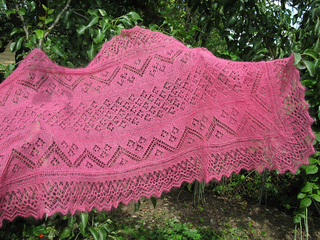 The shawl is modular, and each section adds to both length and width of the shawl. The first section determines the proportions between length and width, as each subsequent section adds equally to both. 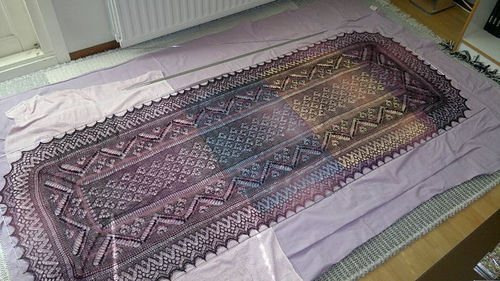 Two provisional CO methods are used, one a simple CO method using scrap yarn, and the other (for the edge) a more advanced method of knitting a repeat in scrap yarn, changing yarn for the last row of the repeat and then commencing with the project yarn for the sideways knitted-on edge. 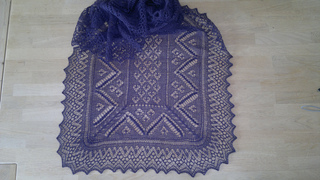 Sideways knitted on edge with every row patterned. Grafting together the beginning and end of the edge seamlessly. Be aware that there is no tutorial included for grafting. Picked up stitches around the entire central panel. Also needed: Stitch markers. Beads if you like, to use instead of nupps. Crochet hook and two colours non-fuzzy waste yarn (A and B) of same or almost the same thickness as project yarn, for provisional CO. Darning needle for grafting together the beginning and end of the edge.